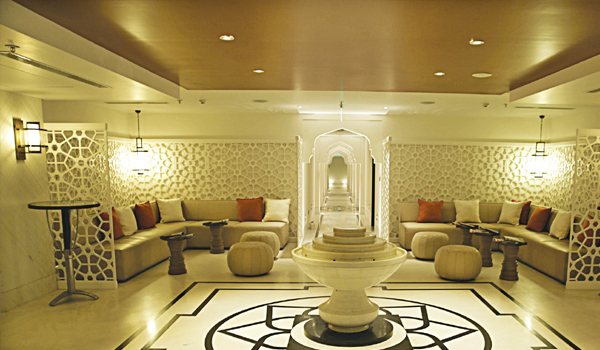 With an Aromatherapy Bar and mood lighting, Amrtam spa opens at Crowne Plaza . They say colours can affect your mood. At Amrtam, the newly-launched spa at Crowne Plaza Chennai Adyar Park, the design and dA�cor ensure that you leave in a good mood. A neutral palette of whites and bronzes is punctuated every few feet with hues designed to lift your spiritsa��red for warmth, orange for energy, blue to soothe and so forth. In fact, I realise later that even the shower fixtures come with bands of lights, to enhance your state of mind. But Ia��m getting ahead of myself. Since Ia��m early, I take a quick tour of Amrtama��begun in collaboration with Escenza Wellness, a Pune-based premium spa operations companya��checking out a central water body created in the shape of an agarbathi holder (incidentally, the spa also smells delightfully of incense), and taking a quick peek at their well-equipped salon. When I notice the mandalas on the floor, spa manager Shivani Mamgain shares that they have been created to focus energies, just like the patterned domes positioned above all the treatment tables. Since the spa has been designed to engage all five senses, ita��s not surprising that aromatherapy plays a big role in the treatments provided. Their signature is an Aromatherapy Bar, where guests can choose essential oils from boxes labelled detox, rejuvenating, relaxing and energising, and make their own blends to addresses their specific needs. But since they are still adding the finishing touches (it will be ready in the next few days), I opt for a luxurious candle massage preceded by a moisturising and energising sandalwood, jasmine and orange scrub. I choose the Swedish massage (though a deep tissue is on the menu, too, and for those whoa��d like a more traditional approach, a separate Ayurveda room is available with a specially-crafted jackfruit wood table). The masseuse is proficient, working out all the knots and making sure the candle a�?waxa��a��soy butter that melts, but never feels too hot on the skina��liberally coats the skin. A steam (if you choose it) and the aforementioned a�?shower with lightsa�� end a very relaxing 90 minutes. Mamgain adds that soon they will be opening a spa bar, where they will offer cold-pressed juices, healthy snacks and even a products like detangling combs, moisturisers and essential oils.